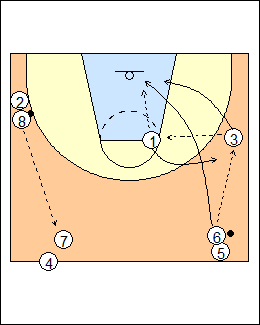 1 passes to 2 and basket cuts, 2 passes to 3 then goes to rebound, 3 bounce passes to 1 for a layup, 3 replaces 2, 1 replaces 3, 2 outlets to 8 and follows. At the same time, swing the other ball from 4 to 6, players follow their pass. Carey - 2 goes over 3 to rebound (shown), 1 curls around the rebounder to replace 3. Amazing ball movement. McKenzie - 2 follows 1 to rebound, instead of going over 3. 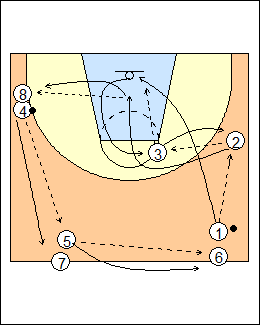 Start with one ball (add a second) and two players at each position, with extra players behind 6. 6 is the next shooter, passing to 3, and will replace 1. Here 3 follows 6 to rebound. Also see Layups - Blackford 42, Auriemma fast break, Auriemma backdoor.